Interesting view, and in 2010 I would agree with you. But in 1976, when I first read the book, what you call “generic” wasn’t. Terry Brooks had yet to publish the first truly egregious Tokien clone, Dungeons and Dragons was this weird new thing, and Star Trek was still recent enough that people like MZB could get all excited about oh! boy! Earth vs. Medieval Aliens! and it really was new and fresh enough to merit a Nebula nomination. At the time, this was high-end SF. Compared to the utter one-dimensionality of the prose of, say, Arthur C. Clarke, the book was considered to be fairly well-written, and its ideas were borderline radical. It was, for the genre and the period, complex and edgy and original. The fact that MZB dared portray gay characters at all was well outside the norm, and the general cultural view of women hadn’t moved much past Yeoman Rand in her tight little miniskirt (and she was radical in concept, too–a woman! on a ship! doing an actual job!). This was real, solid, chewy stuff with a side dish of oo! daring! 35 years later, yes, it’s generic-yadda-yadda. But generic-now is generic in part because of people imitating this book. It’s a forerunner, not a follower. Back when there wasn’t much else like it, it was Really Cool Stuff. I can’t agree with you here. For my money, Clarke’s writing is much better than anything in this novel; and even if you disagree, while the fashions of “good writing” change over decades, a lot of the basics do not, and there’s just no way you can justify this as “fairly well written” compared to contemporary works such as by Le Guin, or Tiptree, or M John Harrison. I’m well aware that the novel is historically significant, but that’s a little beside my point about its genericity, which is tied much more closely to the quality of the writing. I’m not saying it’s wrong to defend novels on grounds of historical significance — I’m sure the sf community today is making flawed judgments, and I’m sure we won’t know what they are for another thirty years; all we can do is try to be demanding readers, I guess — nor wrong to read works for their historical significance. I’m saying that the historical significance of The Heritage of Hastur is that contemporary praise for it is primarily a sad comment on the standards the sf community of the time was using to pass judgment. Terry Brooks is a good comparison. It’s not, at least for me, the fact that Brooks and Bradley borrow from others that makes them uninteresting; it’s that they do it so badly, they filch various elements and patterns only to reproduce them in the most pedestrian manner imaginable. As for groundbreaking political awareness: it was nominated for a Nebula in the same year as Dhalgren and The Female Man. I never understand the “Clarke’s prose was flat” meme. It seems completely at odds with my experience of the core books and stories, all of which contain passages of genuine poetry. Even the “plain and transparent prose of as Asimov” was skillfully plain and transparent. It truly read easily, and conveyed what Asimov wanted to convey. Bad prose does not even read easily, and conveys only something in the general neighborhood of what the writer wishes to convey, if that much. I would agree that Clarke was better, though. Yes, he did occasionally achieve a sort of cool poetic affect that really worked. I see where Judith is coming from. I read THE HERITAGE OF HASTUR when it came out, and between being a teen and something about the times, it didn’t seem too awful. I read a lot of MZB right about then — I guess all of Darkover up to HERITAGE and the next two or three novels after it — and I generally enjoyed them. I will say that even then I was surprised by the Nebula nomination. I returned to Darkover a couple of decades later and found it horrid. For a kinder view of the novel (which I somehow missed when googling for reviews before I originally posted), see Jo Walton’s take. since I will also take part in the SF masterclass, I’m following your blog regularly – great stuff. 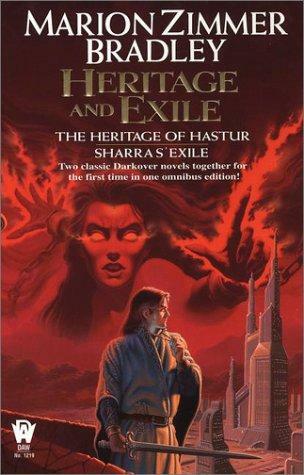 For me « The Heritage of Hastur» this was definitely the weakest of the three novels on the reading list. And I would agree that some of its flaws have little to do with the time it was written, but are really just problems of basic dramaturgy. Too many changes in the plot are foreshadowed too often. We are told over and over again, that things will turn out bad when Lew starts to teach the new circle. To me, the way MZB tried to evoke a dark, fateful atmosphere fellt really clumsy. Looking forward to meeeting you. Likewise! And yes, “problems of basic dramaturgy” — that’s it precisely. I finished Winterstrike yesterday, and it’s very much the middle book for me, in terms of interest. And yet at the same time, because it’s contemporary and I know the contemporary field so much better, I can see more to talk about, in some ways. I didn’t dislike it anything like as much as you did. Yes, it’s not great, and it’s a bit generic, but there is a driving narrative flow that kept me turning the pages. Though, like the first three Star Wars films, it depends a lot on knowing who these people are from the previously published sequel.